PHILADELPHIA, PA – September 17, 2018 – Janney Montgomery Scott LLC (“Janney”), a leading full-service wealth management, financial services, and investment banking firm headquartered in Philadelphia, PA, announced the hiring of William Daniels, Financial Advisor, to the firm’s Williamsport, PA branch office. Mr. Daniels was previously affiliated with Wells Fargo Advisors. Mr. Daniels, a 12-year industry veteran, manages financial assets and liabilities for individuals, businesses, retirement plans and trusts. He is on the membership committee of the Williamsport/Lycoming Chamber of Commerce, serves as Chairman of the Montoursville Chamber of Commerce and is a board member of North Central Sight Services. He earned a BS in History from Bloomsburg University of Pennsylvania. 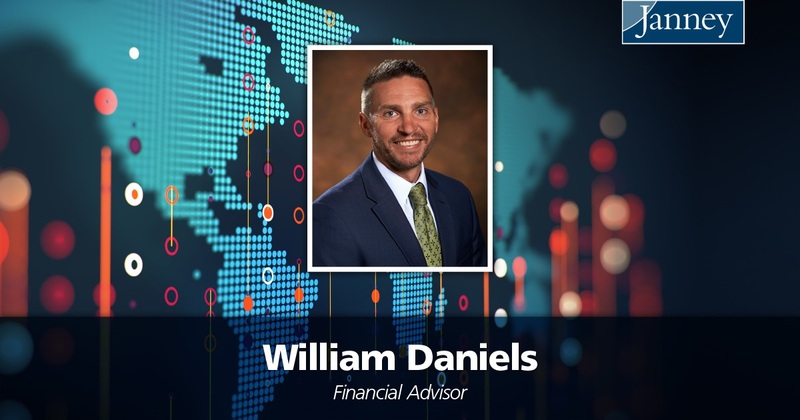 Mr. Daniels is the second Financial Advisor to join Janney’s Williamsport branch office in the last year. In November 2017, Matthew Cramer, First Vice President/Wealth Management, joined Janney’s Williamsport office from Merrill Lynch. Janney’s Williamsport, PA branch office is located at 25 W. Third Street, Suite 600, Williamsport, PA 17701.